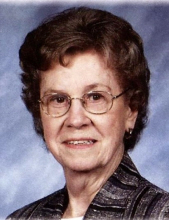 Phyllis Jean Huntley, 90, of 339 E. Jamestown Rd., Greenville, (West Salem Twp. ), PA, formerly of 135 Fredonia Rd., Hempfield Twp., passed away at 9:25 am on Thursday, March 21, 2019 at The Heritage at St. Paul's in Greenville. She was born in Greenville, PA on November 29, 1928 to the late, John and Thelma (Krichbaum) Ramsey. Phyllis was a member of the Zion's Reformed United Church of Christ in Greenville, PA, where she previously served as a Deacon, an Elder, and remained very active within the church. She worked for Bell Telephone Company as a switchboard operator and became a proud homemaker following the birth of her children. Phyllis enjoyed baking, sewing, and quilting. She also loved taking care of and spending time with her family, especially her grandchildren. She was married to Richard "Bud" E. Huntley on October 7, 1949 and he preceded her in death on February 5, 2001. Phyllis is survived by: three daughters, Debra J. Cornman, and her husband, Donald, of Greenville, PA, Vicki L. Huntley of Greenville, PA, and Kimberly A. Iliff, and her husband, Gary, of Hadley, PA; three sisters, DeVee Love of Greenville, PA, Janet Christman, and her husband, Ronald, of Birmingham, AL, and Cynthia Snyder of Greenville, PA; three grandchildren, TeAta Cornman of Wheatland, PA, Kari Iliff of Hadley, PA, and Hali Iliff of Hadley, PA. In addition to her parents and husband, she was preceded in death by her brother, Richard Ramsey. All services will be private at the request of the deceased. Memorial contributions can be made to: Zions Reformed United Church of Christ, 260 Main St., Greenville, PA. 16125. Messages of sympathy, stories, and photos can be shared at: www.osborne-williams.com. To send flowers or a remembrance gift to the family of Phyllis Jean Huntley, please visit our Tribute Store. "Email Address" would like to share the life celebration of Phyllis Jean Huntley. Click on the "link" to go to share a favorite memory or leave a condolence message for the family.